Gyros Bowls with Tzatziki Sauce - Get the Good Stuff! I’ll admit it: I love messing around in the kitchen. Cooking, baking, inventing things, puttering around … it’s all great. When the kindly folks at Good Cook offered me an interesting pan to try, I leapt at the chance. Sure, I said, I’ll bake a bowl! Then there was the fun of deciding just what to bake. Brownies or chocolate chip cookie bowls? Too obvious, I thought. I wanted to take this in a savory direction. Why not do something interesting and low in carbohydrates? Put the egg in a medium mixing bowl, and beat it lightly with a fork. Add the lamb and herbs, but don’t mix them in yet. Heat a small skillet, add the oil, and sauté the onions until they are translucent and just beginning to turn color. Add the garlic, stir to combine, and then turn this mixture out into the bowl with the eggs and meat. Let it cool for about 10 minutes, then mix together well. Divide the lamb mixture into six parts, and put each into one well of the Good Cook Bake-a-Bowl pan. Pat the meat up the sides of the wells, making a definite hollow in the center of each. Fit the top piece of the pan onto the bottom piece, sliding the side-tabs into the bottom pan’s slits. Put the pan upside-down on a rimmed baking sheet – this will allow the fat from the lamb mixture to drain away, so that the edges of the gyros bowls are crisped. Cook for 20-25 minutes at 350˚. Carefully remove meat bowls from the pan – remember that the pans and any grease will be HOT – and let the bowls drain on a paper-towel lined plate. To serve: put the gyros bowls on a plate. 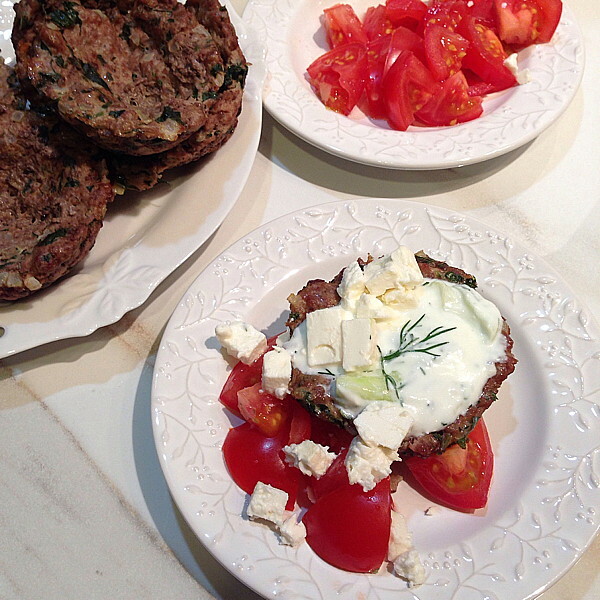 Spoon tzatziki into them, and garnish with chopped tomatoes and feta cheese. Note: the Good Cook company sent me their pan, for which I thank them. What I did with it was totally up to me. If you want to get your own Bake-a-Bowl pan, Good Cook is offering my readers a 25% discount using CODE:BAKEBOWL. Check out these other Bake-a-Bowl recipes! Good Cook sent their pan to some other bloggers, too. Check out what they came up with! I will lick my fingers!! I hope you do try this, and have tons of fun! I think that butterscotch cookie cups will be my next use of this pan.